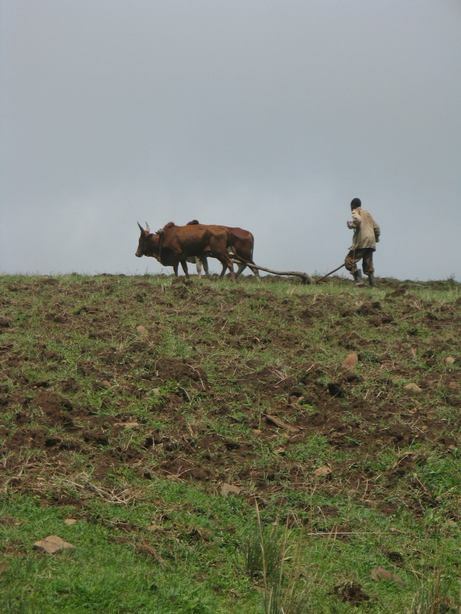 All my pictures from this point in my trip were destroyed by hardware failure so here is an unrelated picture from Ethiopia of a guy plowing. Rwanda has the highest population density of any country in Africa. It's to the point where they can't feed themselves and they don't have minerals that they could sell for food. But then you cross the river into Tanzania and there is just empty forest for miles and miles. It turns out there are bandits in the forest. The young soldier told me this when I went through the road block. They like to rob people bringing stuff from the coast to Rwanda. It's quite hilly and the bandits attack the lorries when they are moving slowly up the hills. I'm not an idiot, so I obviously told him that in the light of the bandit situation, perhaps I should take the bus. But the soldier told me, "No no. You'll be fine. I'm just saying that if you see anyone with an AK, then if he's wearing a uniform, that's a police man. He's your friend. But if you see someone with a gun and he's not wearing a uniform, be very careful with him because that's a bandit." He smiled cheerfully, and waved me on through. I would have taken the bus despite his reassurances but I couldn't afford it. Someone had written on their blog that there were ATMs as soon as you got into Tanzania, but I had taken it too literally and not changed enough money at the border. I had less than $10 in local currency on me. The good news was that the government of Tanzania evidently was serious about dealing with the bandit problem. I was passed two times by a police patrol. They were in a pickup truck. There were four skinny guys with AKs at each corner and a fat guy in the middle with a high calibre mounted machine gun. They all had uniforms on, so I knew they were my friends. It was about 80 km to the next town. There was no bank, so I decided to press on. I asked the policeman at the road block if the next section was safe. He had to think about it for a minute before he answered me. Finally he smiled and told me, "Well, you've come from that side; this side is exactly the same. You'll be fine!" It was a nervous day though. All along I just imagined invisible bandits running through the forest keeping pace with me. It was a record distance day for me despite the hills. Any more adventures after that?